Posted on 27 October 2011. 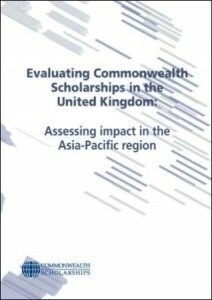 This report analyses the impact of Commonwealth Scholars and Fellows in the Asia-Pacific region, which, for the purposes of the analysis, is divided into three sub-regions: Australia and New Zealand, Pacific Islands, and South East Asia. As well as outlining some of the key issues for the region, it looks at the impact of awards on individuals and on a wider scale. Published for the Commonwealth Heads of Government Meeting (CHOGM) in Perth, Australia, in October 2011.